Do you have a list of folders you access regularly? You know, the same ones you open every time you start up your computer. If so, you can set up your computer so that those folders are opened automatically each time you boot up the Windows Vista operating system. Let's check it out! 1.) First, open Windows Explorer. 2.) Next, select Organize from the toolbar at the top of the window. 4.) Now, click on the View tab. 5.) Check the option that says "Restore previous folder windows on log on." 6.) 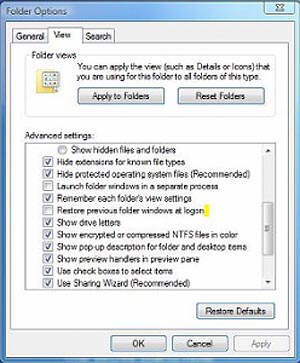 Click Apply and then OK.
Now, when you log off, restart or shut down your Vista computer, it will automatically open the previously opened folders. It's the perfect way to save yourself some time and energy. Give it a try today!